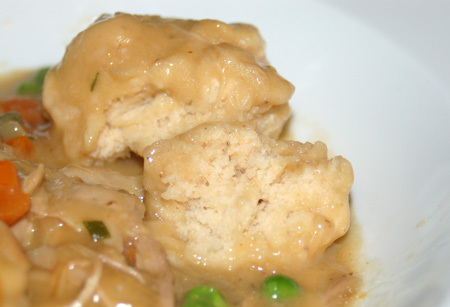 My prior experience with chicken and dumplings was on the few occasions my mother made it during my childhood, using Bisquick mix for the dumplings. One of my major peeves as a picky eater is soggy bread—the way it loses its integrity, getting almost gelatinous, then slimy, before dissolving entirely. My husband is a dipper, so I always make sure we have some sort of crackers, bread or biscuits on hand whenever I make a soup or stew, but I almost can’t watch him crumble it all up together. I am, however, a serious fan of gravy, which is why I decided to give chicken and dumplings another chance. 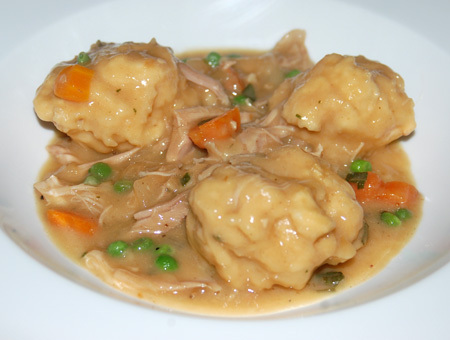 One look at chicken and dumplings, and you can practically see its humble origins. It is “poor food,” designed to use every bit of a chicken along with its cooking liquid; not only do the inexpensive dumplings fill you up, allowing a single chicken to feed a larger number of people, the fact that they are cooked right there in the same pot saves energy and dishes. Since I had just braised a chicken a few days ago, I already had two quarts of rich brown stock in the refrigerator (and there is always more in the freezer), so I saved myself some time on that score. I also used just thighs and legs for this meal, since the breasts went into that curried chicken fricassee. So how did the dumplings come out? While I think they could have been lighter (I probably should have sifted my flour; I needed to add extra liquid at the last minute when my dough seemed way too dry), they didn’t trip my sog-meter too badly and I actually went back for seconds. Jeremy thought they were great, and Nolan ate most of his after smushing it all up into glue with his fingers. I can easily imagine myself making this instead of open-faced gravy sandwiches to use up leftover chicken or turkey—providing, of course, that the mashed potatoes are already gone. I have my standards, after all. Season the chicken legs with salt and pepper. In your largest skillet or sauté pan, sear the chicken over medium high heat until golden brown; remove to a plate. Add the onion and carrot (you may also want to throw celery in there, but I have a hard time keeping that on hand… it tends to go squishy before I can use it up, so I usually do without), season with salt and pepper, and sauté until tender; add the garlic and cook for about a minute more. Nestle the chicken parts among the vegetables, add the bay leaf, and add enough stock to come about halfway up the sides of the chicken. Bring to a boil, reduce to a simmer, and cook covered until the chicken is very tender, about 20-25 minutes. Remove chicken parts from the pan and set aside. When they are cool enough to handle, remove the meat from the bones in 2-inch chunks or strips. While chicken is cooking, sift together flour, baking powder, and salt in a medium bowl. Add (optional) chopped fresh herbs, melted butter, and milk to the dry ingredients. Gently mix with a wooden spoon until mixture just comes together. (Note: do not overmix! or your dumplings will turn out dense.) Set aside. Heat reserved chicken fat (or butter) in a small skillet. Whisk in flour and cook, whisking constantly, until flour turns golden, 1 to 2 minutes. Whisking constantly, gradually add sherry or vermouth; it will bubble up and thicken immediately. Scrape the roux into the skillet or saute pan with the chicken’s cooking liquid, stirring to combine. Simmer until mixture thickens slightly, 2 to 3 minutes. Stir in the herbs, shredded chicken and optional cream; return to a strong simmer. Add salt and freshly ground black pepper to taste. 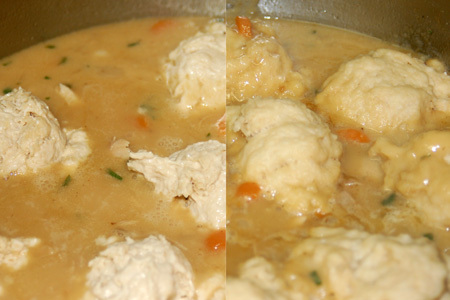 Drop dumpling batter into the simmering stew by heaping tablespoonfuls, leaving an inch or two of space between them. I found my 2-T disher to be the perfect vehicle for forming dumplings. Cover and simmer until dumplings are cooked through, about 15 minutes; do not uncover while they are cooking, as a build-up of steam will cause them to be light and fluffy (the alternative is gummy, dense boiled dumplings—no thank you!). If after 15 minutes they are still not cooked through (use a toothpick or skewer to test), cover pan again, and cook for another 5 to 10 minutes. Gently stir in peas. Ladle portions of meat, sauce, vegetables, and dumplings into soup plates and serve immediately. This looks just like my mother’s delicious chicken and dumplings. Now I need to go visit my mom and have her make me some chicken and dumplings. I can cook them myself but somehow, her’s are always better. Looks fantastic! Sauce looks so rich and creamy. YUM! Looks good for when the weather gets cooler. The last time I made dumplings (which has only happened a time or 2 because I am invariably disappointed) I added about 1/2 c of cornmeal in place of some flour. It gave a nice crunchy texture. No more crackers necessary! May Ling Wu, slow-cooked chicken broth makes all the difference! Sauces made with boxed broth looks almost anemic to me now by comparison.